- Oil-less piston design for low maintenance operation. - Piston style provides high performance for the demanding professional. - Compact portable design perfect for artists on the go. - Set and lock regulator prevents settings from changing in the locked position. - Integrated pressure gauge for convenient pressure readings. - Integrated moisture trap with petcock release helps keep moisture out. - Retractable handle stows away when not needed. 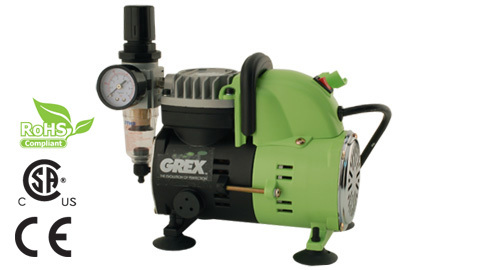 - Automatic shut-off turns compressor off when not in use to save power. - Manual on/off switch allows complete shut-off. - Integrated airbrush holder for convenient airbrush access. - 12’ long coiled plastic air hose for easy space-saving setup. - Standard 1/8” fittings for interchangability of hoses and airbrushes. - CE, CSA and RoHS Compliant certified.